Since I described the concept with some detail in an earlier post (see “Fast-traking climate adaptation–Tapping our natural tendency to experiment“), I’ll simply share a few slides from my seminar talk last week that capture the gist of the problem and why I want to bring the concept of adaptive muddling to bear on it. Humans have always adapted to change. Until about 150 years ago, external forces produced the changes and they generally happened on geological timescales. Today we understand that human activity has become its own geological force such that there’s even discussion of an Anthropocene epoch, named as such to highlight humans as the principle drivers of change on the planet. The changes triggered by our surpassing of at least three of nine key planetary boundaries are happening not only faster than previously predicted but also faster than any planetary-scale changes humans have had to adapt to in the past. For many readers this account of our current situation will be quite familiar. Here’s where our best minds, so far, have failed. Scholars, politicians, business leaders and others have debated, developed, and sometimes tested strategies to prevent a headlong rush past all nine boundaries including global institutions, market mechanisms, and even geoengineering. None of these top-down approaches seem to be working and their potential to evolve into future fixes might not come soon enough given the pace of change now occurring. Adaptive muddling offers a bottom-up path that deserves our attention. 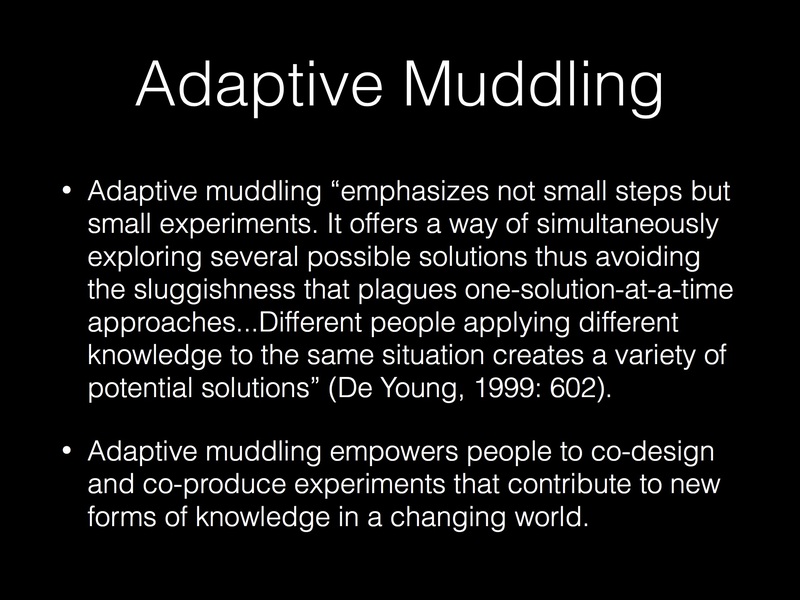 De Young: “[Adaptive muddling] emphasizes not small steps but small experiments. It offers a way of simultaneously exploring several possible solutions … Different people applying different knowledge to the same situation creates a variety of potential solutions” (1999: 602). Smith et al. : “[Grassroots spaces contribute] a reflexive plurality to thinking about technological futures and social change: because grassroots spaces contest mainstream innovation, and because they widen the adaptable ideas and pragmatic solutions available to the wider social world of innovation” (2013: 9). As I’ve written in a previous post, the downside to adaptive muddling is that we don’t currently have the mechanisms to pool the dispersed knowledge emerging from the thousands of ongoing community-based sustainability experiments happening around the world. That’s where the Sustainability Experimentation Venture Network (SEVeN) that Pradip Swarnakar and I have envisioned comes in. SEVeN, described in more detail here and here, can potentially stimulate and speed up grassroots sustainability experimentation, and then by aggregating the knowledge emerging out of these experiments, facilitate the iterative process essential to adaptation as well as inform efforts to diffuse and/or scale up innovations from successful experiments. “Different people applying different knowledge” and widening “the adaptable ideas and pragmatic solutions available to the wider social world of innovation” are useless to us if we do not have the means of documenting and learning from the diversity of experiments unfolding around the world on a daily basis. 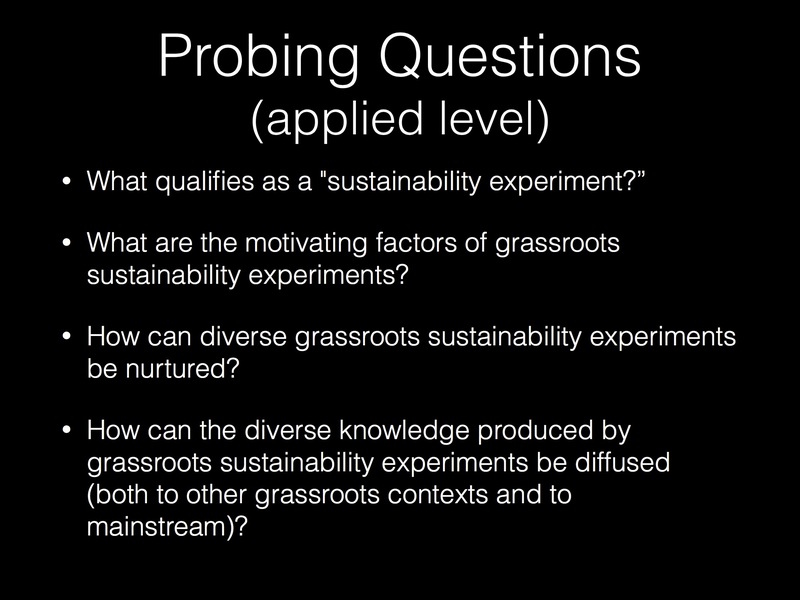 But putting so much value on adaptive muddling in the form of grassroots sustainability experiments raises some fundamental questions (some of which are partially addressed by existing research both in the sustainability transitions field and behavioral sciences more broadly). 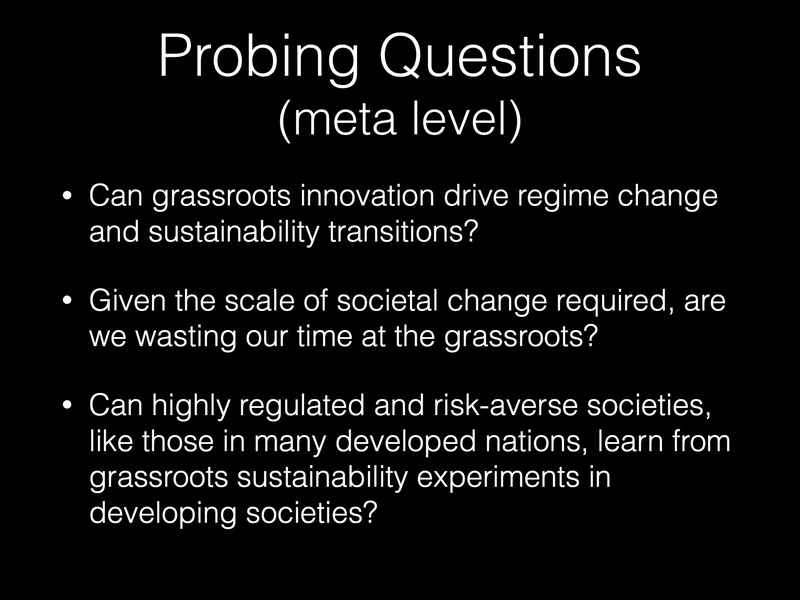 Answers to these questions, however, prompt certain meta-level questions about processes of social change. Ylä-Anttila employed a “bee swarm” model to suggest that social movements are one among many “bees” working to push society towards sustainability. Other bees include international institutions and scientists, among others. But there are bees pushing in the other direction as well. These include some governments, political parties, and corporations. Achieving sustainability requires multiplying the bees pushing towards sustainability and reversing the direction of those pushing against it. Old models of social movement organizing, according to Ylä-Anttila, focused on changing core beliefs in the broader public and in the opposition. But in their work on comparing climate change policy networks, Ylä-Anttila and colleagues conclude that a more effective change strategy might be focusing on “instrumental means.” In other words, are there policy instruments on which all involved parties can agree without invoking fundamental differences in core beliefs? If so, then the bees swarming for sustainability should direct their energies towards effective and comprehensive policy instruments, for example. Ylä-Anttila’s presentation spurred interesting questions and discussion. Should sustainability experiments be seen as potential sites of compromise where two or more powerful actors are in opposition? How would sustainability experiments need to be framed to gain acceptance from sustainability’s “opposition bees?” These questions pointed to the potential usefulness of framing certain efforts and initiatives as sustainability experiments, but they also reminded us of a persistent theme throughout the seminar’s presentations: sustainability experiments must be defined in meaningful and useful ways that allow us to leverage the knowledge produced through grassroots sustainability experiments by linking it to institutional decision-making. De Young, R. 1999. “Tragedy of the Commons.” In D. E. Alexander and R. W. Fairbridge (Eds.) Encyclopedia of Environmental Science. (Pp. 601-602) Hingham, MA: Kluwer Academic Publishers. De Young, R. and S. Kaplan. 2012. 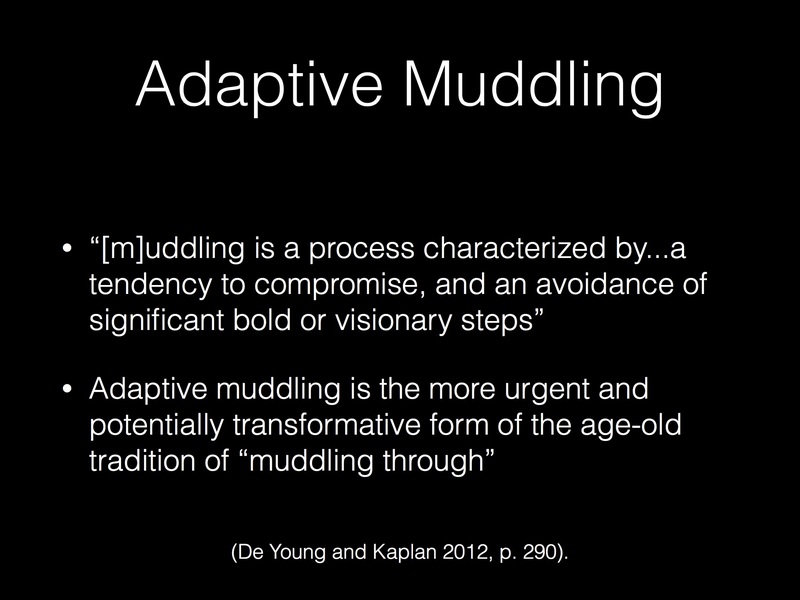 “Adaptive muddling.” In R. De Young and T. Princen (Eds.) The Localization Reader: Adapting to the Coming Downshift. (Pp. 287-298) Cambridge, MA: MIT Press. Rockström J, et al. 2009. A safe operating space for humanity. Nature 461: 472–475. Smith, A., M. Fressoli, and H. Thomas. “Grassroots innovation movements: challenges and contributions.” Journal of Cleaner Production 63 (2014): 114-124.